Dr. Gerard Cramer has spent his whole life finding ways to work with dairy cows. 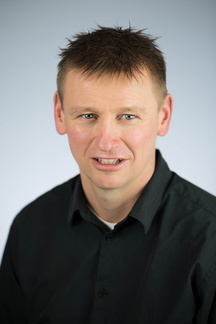 Prior to joining the University of Minnesota, Gerard spent time running a dairy farm, owning a foot health specific veterinary practice and getting both a Doctor of Veterinary Medicine and Doctor of Veterinary Science degree from the University of Guelph. Joining the faculty at the University of Minnesota in 2013, Gerard splits his time between educating veterinary and graduate students and doing foot health related research. Current research projects include evaluating hoof trimming methods, the relationship between ketosis and antimicrobial resistance in hoof trimmers. Evaluate and develop safe and effective prevention and intervention strategies for common foot diseases. Effect of the application of hoof blocks on dairy cow productivity and welfare. Evaluate the human health risk for the antimicrobials used in treatments for foot diseases. Effect of transition cow health and metabolic status on foot health. Investigate the herd level factors that influence lameness incidence. Develop effective industry level programs that facilitate changes at the herd level to reduce lameness incidence.